If you need to use a formula, you can create a new column or row and simply link to the cells with a – in front of the reference e.g. =–A5. If the number in cell A5 is positive it will change to negative and if it is negative it will change to positive. NOTE: We recommend creating a seperate column/ row as you never know when you need to go back to the raw data for whatever reason. Perhaps your situation is different. You want to ONLY change the negative numbers to positive numbers and the positive numbers must stay the same. First option would be an IF function. =IF(A5<0, –A5, A5) (to learn about IF look at the free Excel Fundamentals Course). will convert a negative number to positive, and leave a positive number alone. Sometimes you may just want to quickly change negative to positive numbers. We recommend you keep the original raw data so the ideas above are best, but perhaps this is just a once off and you need to do it quickly and in place with no new columns. 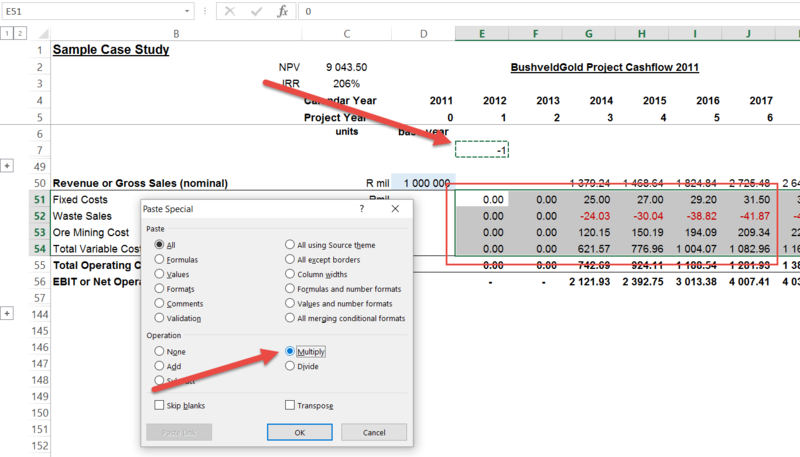 You have probably used the Paste Special function in Excel, but did you know that you can use it to overwrite numbers with themselves but with the opposite sign? Below we want to change the red block to the opposite sign. What you are telling Excel is to take the -1 and multiple it into every cell you have highlighted.